Heat a large skillet over medium-high heat. Add the beef and season with salt and pepper. Cook the meat, stirring often, until browned. Transfer beef to slow cooker. Add the bell pepper, crushed tomatoes, salsa, corn, taco seasoning, and broth or water. Stir. Cook on low for 5-6 hours or high for 2-3 hours. Stir in the pasta. Cook on high for 10-20 minutes. Pasta cook time will vary by slow cooker, begin checking for doneness at 10 minutes. Stir in the cheddar cheese and serve. From freezer, adjust crockpot settings. Bag 1 - Meat Mixture -- Thaw and Cook bag of meat on low for 5-6 hours or high for 2-3 hours. Bag 2 - Pasta -- Stir in the pasta. Cook on high for 10-20 minutes. Pasta cook time will vary by slow cooker, begin checking for doneness at 10 minutes. Bag 3 - Cheese -- Stir in the cheddar cheese and serve. Spray a 9x13 casserole dish with cooking spray and set aside. In a large bowl, combine and whisk together cream of chicken soup and water to the prepared dish. Stir in uncooked rice, uncooked chicken and frozen broccoli. Season with 1/2 t salt and 1/4 t pepper. Bake, covered, for 1 hour or until liquid is absorbed, the rice is tender, and the chicken is cooked through. Remove from freezer, thaw completely and bake covered for at LEAST 1 hour. Mix celery, onion, chicken broth, milk, garlic, sour cream, ham, salt and pepper in a gallon size Ziploc freezer bag. Add potatoes and mix. Remove all air from bag, seal and lay flat on a cookie sheet to freeze. Place cheddar cheese into pint size freezer bag and freeze. Place thawed mixture from gallon freezer bag into 6 qt. pan. Simmer for 15 minutes. Sprinkle cheese on top of each serving. * This recipe is adapted from Pampered Chef "Main Dishes" Cookbook. I doubled the below recipe, adapted slightly, and used 1 zucchini and 1 yellow squash instead of 2 zucchini. There are 2 different ways you can make this. You can load all the ingredients into a gallon sized Ziploc bag, lay it flat, freeze, and cook it in the crock pot at a later date or layer the ingredients in a foil pan, seal and pop in the freezer. Crock Pot Cooking Method: Cook from frozen on high for 8 hours or until chicken is thoroughly cooked, or thaw overnight in the refrigerator overnight and cook on low for 4 to 6 hours or until chicken is thoroughly cooked. Oven Cooking Method: Thaw overnight in the refrigerator. Cook at 350 degrees for 50-60 minutes or until chicken is cooked thoroughly. Serve over cooked spaghetti noodles if desired. In large stockpot, brown the sausage and onion with the butter. Add potatoes, carrots, and water. Bring to a boil; reduce heat; cover and simmer for 15-20 min or until potatoes are tender. Remove from heat and add remaining ingredients. Cool. Pour into gallon freezer bag. Lay flat to freeze. Thaw in fridge. Heat on stovetop until heated through. In large bowl, combine spices, hot, and BBQ sauces. Toss with raw chicken and potatoes, until pieces are evenly coated. Pour into greased 9x13 pan. Bake at 400 for 45-55 min. or until potatoes are soft and chicken is done. Cool. Cover and freeze. Freeze green onions, bacon, and cheese in separate bags. Thaw casserole in the fridge. Bake, covered, at 350 for 45 min, or until heated through. Cover with bacon, green onion, and cheese. Return to oven to melt the cheese. Trim all fat from chicken breasts. Flatten chicken breasts to 1/4" thickness. Here is a method I've found successful for flattening chicken. Lay a large piece of Glad Press 'n Seal on the counter. Place 6 breasts on top. Cover with another piece of Press 'n Seal. Seal well around the edges. Pound meat with a meat tenderizer. Move chicken to a tray lined with parchment paper. Mix remaining ingredients in a bowl. Spread evenly on top of all 6 chicken breasts. Place tray in the freezer and flash freeze the chicken. This means, leave chicken in freezer until each piece is individually frozen. This usually takes 3-4 hours. Place frozen chicken breasts in a gallon size Ziploc freezer bag. Label and freeze. Option 1: Take out the number of chicken breasts that you would like to cook. Place them in a baking dish. If any of the topping is stuck to bag, try to add it to the top of the chicken breasts. Thaw completely. Bake at 425 for 20-25 minutes or until cooked through. Option 2: Cook from frozen. Bake on 425 for 45 minutes, or until internal temperature reaches 165-170 degrees. Mix all the seasonings. Marinade the pork tenderloin in the sauce for an hour or more, up to 6 hours, in the refrigerator. Cook until internal temperature reaches 165 degrees. GRILL: Grill for approximately 20-30 mins, turning every 5 mins. BAKE: Preheat oven to 325. Bake in pan for approximately 50-60 mins. BROIL: Place in a pan 4 inches from heat. Broil for approximately 20-30 min. turning every 5 mins. Prepare pasta shells according to box instructions. Rinse; run cold water over them; drain well. Brown ground beef with onion until cooked; drain off fat. Return beef to skillet and add taco seasoning and tomatoes. (I processed the tomatoes in a blender as to not have large chunks of tomatoes). Add 1 c. cheese to mixture. Stuff beef mixture into shells and arrange in greased 9x13 pan. I could fit about 24 shells into the pan. If there is any remaining beef mixture, pour on top. Cover tightly and freeze. Put remaining 1 c. of cheese in baggie and freeze as well. Thaw completely in fridge. Bake at 350, covered, for about 30-45 min (or until heated through). Remove lid and cover with 1 c. cheese. Return to oven and bake until cheese is melted and casserole is bubbly. Add beef to the freezer bag. Combine ¼ cup olive oil, garlic, oregano, salt,pepper and lemon juice in a small bowl. Pour over the meat and toss to coat, in the slow cooker. Toss in the sliced onions. Freeze. Pour bag contents in slow cooker. Cover and cook on LOW for 6-10 hours (depending on your slow cooker) or until beef is extremely tender. (If it’s not tender, it’s not done yet). Remove lid and salt and pepper to taste. If desired, break up the meat into smaller bite-size pieces. Make the tzatziki sauce (or use store bought). Combine yogurt, cucumber, dill, salt and garlic in medium bowl. Stir until creamy and combined. Salt and pepper to taste. Serve beef over pita folds with Tzatziki sauce, onions, tomatoes and lettuce. Place chicken in a gallon ziploc bag, Sprinkle ranch seasoning on top. Place butter slices on and freeze until ready to cook. Thaw chicken, Place chicken in bottom of the slow cooker (I used a 4 qt). Cook on low 8 hours. Serve and enjoy! In large saucepan, heat up soup, water, and cheese until cheese is completely melted, stirring frequently. Pour about 1/3 of the soup mixture on the bottom of a greased 9x13 pan. Fill the uncooked manicotti noodles with strips of chicken; place in the pan. Layer broccoli on top of noodles. Cover completely with the remaining soup mixture. Sprinkle with parmesan cheese. Cover and freeze. Thaw completely in the fridge. Bake, covered, at 400 for 40 min or until pasta is tender and casserole is heated through. Remove cover and bake an additional 15-20 min, if needed. Mix all ingredients in large bowl. Divide mixture into 8 (1/2 c.) portions. Press into 8 burger patties. Lay flat on a lined baking sheet. Flash freeze. Place frozen patties into Ziploc freezer bag. Place buns into Ziploc freezer bag. This pic is from different burgers I made. Forgot to take photo of this recipe, so I thought this would suffice for now. LOL! Thaw completely or cook from frozen. Grill until done to your liking. Enjoy! 1. Place the olive oil, garlic, lemon and orange zest, lemon and orange juice, basil, oregano and thyme in a resealable plastic bag. Seal and shake to combine. 2. Place the chicken in the bag, seal and shake until chicken is coated with the marinade. 2. Preheat the grill or a grill pan over medium high heat. 3. Remove the chicken from the marinade and season both sides generously with salt and pepper. 4. Grill for 4-5 minutes on each side or until chicken is cooked through. 5. Remove from grill and let the chicken rest for 5 minutes. Sprinkle with parsley and serve, with lemon wedges if desired. In large skillet, brown the beef with onion and garlic. Drain; return to skillet and add seasonings. Stir in drained tomatoes until combined. Slice dinner rolls in half and place bottom half of rolls in 9x13 baking dish. Top with beef mixture & sliced cheese. Top with the top half of the buns. Mix all the ingredients for the glaze in a sauce pan over medium heat (or microwave about 40 seconds) and mix until melted, smooth, and combined. Pour evenly over the buns. Thaw in fridge. Bake at 350 for 25 minutes. Place chicken on bottom of baking dish. Cover with sliced cheese. Mix milk and chicken soup together in a small bowl and spread over chicken and cheese. Thaw completely in fridge. Sprinkle stuffing over top of chicken, cheese and soup. Melt butter and drizzle over the top of stuffing. Bake uncovered at 350 for 45-60 minutes. Melt the butter in a large skillet, add ground beef and cook until brown. Drain most of the fat. Add onions, green pepper, garlic and cook until vegetables begin to soften. Add ketchup, brown sugar, chili pepper, dry mustard, and water; simmer for 15 minutes. Add tomato paste, Worcestershire, and Tabasco and/or red pepper flakes. Season with salt and pepper (if needed). Cook for another 5 minutes. 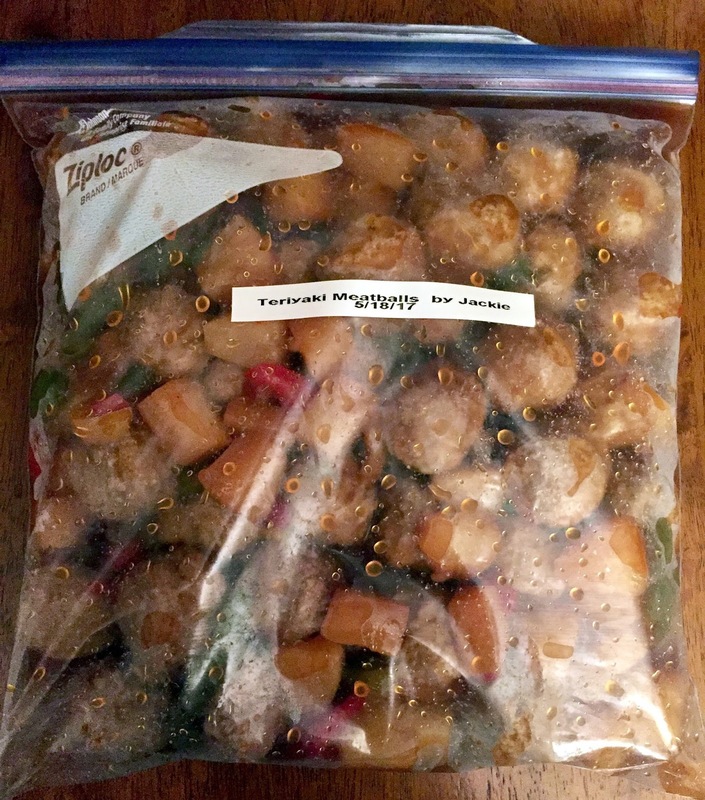 Allow the meat mixture to cool before putting it in a big ziplock bag and lying flat to freeze. Thaw the meat mixture and warm in a skillet (adding water if needed). Once warm, place a scoop on a toasted bun and serve with your favorite fries. Photo of the finished product to come soon. Pour dressing and BBQ sauce into gallon size Ziploc freezer bag. Mix well. Place chicken breasts into bag. Seal bag. Make sure all chicken is well coated with sauce. Freeze flat. Thaw completely. Grill until cooked through. I use to buy taco seasoning packets until I learned how much better it tastes to make my own (well, Alton Browns...), how quick and easy it was, not to mention CHEAP too! I use this taco seasoning recipe for ground beef, chicken, and even shrimp. It's delicious and I hope you enjoy all the flavor it has too. Cut chicken breasts to desired size, set aside. Heat oil in skillet, add onion and garlic and cook until you begin to smell the aroma. Add the chicken, only cook for about 3 minutes. Mix the chicken broth or water with the taco seasoning, add this liquid mixture to the skillet. Place a lid on top and let all the flavor finish cooking into the chicken (about 5-10 minutes, depending on chicken thickness). To freeze: cut chicken into desired size, add in chopped garlic and onion. Thaw and follow the cooking directions above. Thaw, Cover the dish with foil and bake for 10 minutes, then remove the foil and continue baking for another 10 minutes. Cook shells in boiling water per package directions, drain and set aside. Brown ground beef with steakhouse seasoning and onion. Remove from pan with slotted spoon. In a large bowl mix together ketchup, relish, mustard and worcestershire sauce, add ground beef and mix well. In the bottom of a 9 x 13 pan, add the tomato sauce. Top with noodles and spread in even layer. Top with ground beef mixture and spread in even layer. Top with shredded cheese. Thaw completely. Set oven to 350. Bake covered for 30 minutes. Uncover and bake until cheesy is bubbly and brown. Place roast in gallon freezer bag. In small bowl, combine the next 7 ingredients (cheese through salt). Pour sauce in sandwich bag and place inside larger bag with pork. Freeze. Thaw completely. Place roast in slow cooker. Gently squeeze sauce bag to remix all the ingredients; pour over roast. Cook on low for 6-7 hours or until meat thermometer reads 160 degrees. Remove to serving plate and keep warm. Pour sauce in small saucepan and bring to a boil. Combine water and cornstarch until smooth. Add to saucepan and bring to second boil. Cook and stir for 2 min or until sauce thickens. Serve sauce over sliced roast. Do you love an easy meal? As a mom of four active children, I sure do! My slow cooker saves dinnertime for us on a regular basis, especially now, with the busyness of summer! Freezer Friend, Jen, first made this recipe back in 2011, as a baked dish. I decided to try it in the slow cooker and it worked perfectly! I hope you enjoy this delicious, colorful dish as much as we do! Pour pineapple chunks and juice, teriyaki glaze, frozen vegetables and frozen meatballs into a gallon size Ziploc freezer bag. Freeze bag standing up, so it can easily be put into slow cooker while still frozen. Thaw completely. Pour meatball mixture into a 9x13 baking dish. Bake covered at 350 for 30-45 minutes. Serve over the cooked rice. Pour frozen meatball mixture into slow cooker. Cook on low for 7 to 8 hours, or on high setting for 4 to 5 hours, until done. Serve both options over prepared rice. Place rice, butter and salt into quart size freezer bag. Freeze flat. Add rice and 3 1/3c. water in a saucepan. Stir and bring to a boil. Lower heat to simmer. Cover and simmer for 20 minutes or until all water is absorbed. Remove from heat and let stand covered for 5 minutes. 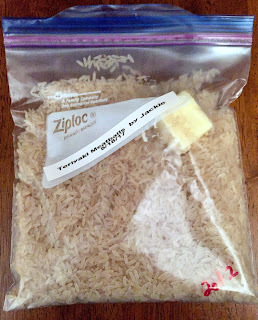 Add rice and 3 1/3 c. water to microwave safe container. Stir and cover. Cook on High (100%) power for 5 minutes. Cook on Medium (50%) power for 30 minutes. Remove from microwave and let stand covered for 5 minutes.